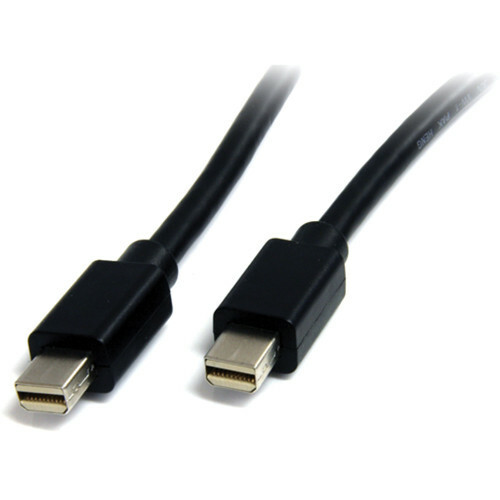 The black 6' Mini DisplayPort Male to Mini DisplayPort Male Cable from StarTech connects a mini DisplayPort enabled laptop to a mini DisplayPort-equipped monitor. Box Dimensions (LxWxH) 7.0 x 6.5 x 0.25"
6' Mini DisplayPort Male to Mini DisplayPort Male Cable (Black) is rated 5.0 out of 5 by 3. Rated 5 out of 5 by Mac User from Works well connection MacBook to iMac I bought this cable to be able to use my iMac 27 2009 as a large external monitor for my 2015 MacBook i7 15. It allows me to use both screens, the large one to work on and the MacBook monitor to hold my windows and tools. The first cable I was sent was in the right bag but was the wrong cable. This one was correct and stays in place and makes a solid contact. There are no cons. Rated 5 out of 5 by Marko from Works fine with two iMacs I have a 2010 and 2015 27 iMacs, so I use this cable in conjunction with the older iMac as a second display in target display mode. Plug the cable and boot both machines, press cmd+F2 on the old iMac and presto, dual display system (note: in order to use the newer iMac as an externar display you need a different cable, but with the older models it works just fine). Rated 5 out of 5 by Leonard from Ideal for connecting 2009 iMac as a monitor Thunderbolt cables will not work when connecting to pre-thunderbolt Macs. This was truly plug and play. Can I use this with the MacBook Air Thunderbolt Display port?